Go hiking with your pup this month. Boughs of white cedar, spruce and fir trees bend overhead, blocking out the sun. In the shade of the forest, a man sits on the banks of a swift-flowing brook and watches his dog wade into the cool water, soaking the leash that joins them. It’s a scorching day in August, and they’ve found their escape. Escape from the heat. Escape from the sun. Escape from the hustle and bustle of Maine towns at the height of tourist season. The man kicks off his boots, peels off his sweaty socks and follows his canine companion into the water. During the dog days of summer, the beauty of the Northeast landscape draws many people outdoors to hike — but some trails are more suitable for this time of year than others. When planning a hike during a hot day, think about two of nature’s finest comforts: shade and water. Select a trail that features a little bit of both, and be sure to also pack some shade — in the form of a hat and sunglasses — and plenty of water. And if you want to bring along your dog, keep in mind that dogs aren’t allowed on some trails in Maine. On other trails, dogs must be kept on a leash. And furthermore, trail rules may specify the maximum length leash allowed. So before you hit a trail, do a little research ahead of time. The following are three local hikes that are perfect for hot, humid days — and dogs. All three hikes feature well-maintained and marked trails that offer plenty of shade and water. So prepare to break a sweat; grab the dog leash, water and bowl; and check one of these out with your canine hiking buddy. Traveling through a quiet mossy forest of conifers, the 0.5-mile Peter’s Brook Trail follows the lively Peters Brook uphill from the ocean to a beautiful waterfall. Constructed and maintained by the Blue Hill Heritage Trust, the trail lies on a conservation easement and is open year round for the public to enjoy. This trail is open to dogs, but they must be kept on leash. The cool, swift-flowing brook is the perfect spot for dogs, and possibly their owners, to cool off on a hot summer day. The hike, out and back, is 1 mile long and travels gradually uphill on the way to the waterfall. Exposed tree roots, rocky areas and a few muddy areas makes footing tricky in some spots. The trail travels through a forest composed mostly of conifers — spruce, white pine, hemlock, balsam fir and cedar trees — with a few oak trees scattered throughout. Growing under the shade of these trees, an abundance of mosses and hardy low-lying plants carpet the forest floor. Since the trail is fairly wide, it’s easy to follow. The only confusing point is a short distance from the trailhead, when the trail comes to a “T.” At this intersection, turn left to continue on the trail. If you turn right, you’ll come to someone’s private field and residence. A few informal side trails here and there will bring you down to the edge of the water, where you can view several tiny waterfalls and churning pools. The trail ends at a waterfall, which is unnamed as far as I know, but is certainly a sight to behold. There whitewater tumbles down over a steep set of natural rock steps to plunge into a calm shallow pool below. Across from the trailhead for Peters Brook Trail is Peters Cove, accessible to the public at the AB Herrick Memorial Landing, which is also owned by the Blue Hill Heritage Trust. A combination of a sandy beach and rocky shoreline, the landing is a great spot for picnicking and playing with your dog by the water. For information about the trail, including a trail map, visit bluehillheritagetrust.org or call 374-5118. How to get there: In the Blue Hill village, at the intersection of Route 172 and Route 176 (also known as East Blue Hill Road), take Route 176 and drive 0.6 miles east, then park on your right at the AB Herrick Memorial Landing on Peter’s Cove. The trailhead is across the road from the parking area, on the east side of the bridge over Peters Brook, and is marked with a blue and white Blue Hill Heritage Trust sign. A trail kiosk that includes a trail map and visitor registration book is located in the woods just a short distance from the road. Built by the Belfast Bay Watershed Coalition, Little River Community Trail officially opened to the public in the fall of 2007. From end to end, the trail is approximately 4 miles long, but is divided by a road into two sections that can be treated as two separate hikes. Though not far from downtown Belfast, the trail feels remote as it travels along Little River through a mature forest. Dogs are permitted on this trail, but they must be kept on leash. 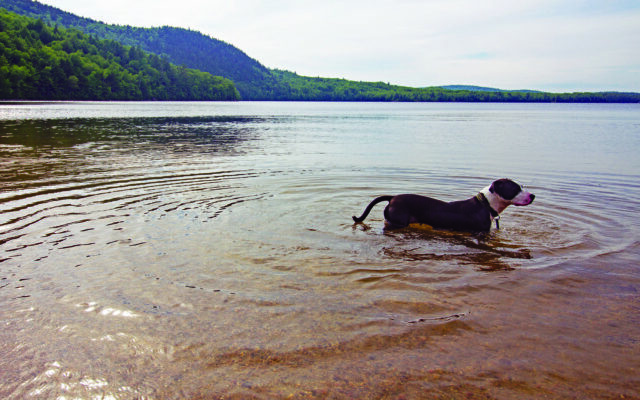 In several places, the trail kisses the shore of Little River, offering opportunities for your canine hiking companion to cool off in the calm water. Beware that this trail dips into gullies and travel along steep riverbanks. Take your time to navigate this uneven terrain. Exposed tree roots and several bog bridges require careful footing as well. The first section of the trail skirts the north shore of Little River’s lower reservoir and passes under tall white white pine trees. In this area, keep an out for the many species of waterfowl that live and feed around the edges of the reservoir. Be sure to give them plenty of space, especially if walking with a dog. The trail follows the water as it narrows into a river, winding through a mature mixed forest. After about 1 mile, the trail comes to a large hayfield off Perkins Road. When the trail reaches the road, turn left and follow the blue blazes to the road’s intersection with Herrick Road and Congress Street. Cross the intersection and approach a sign that reads “Little River Trail” by a dam and Little River’s upper reservoir. Follow the blazes along the water’s edge and back into the forest. This section — which includes some large hemlock trees mixed with a variety of deciduous plants — is approximately 3 miles long and ends at the Walsh Field Recreation Area off Route 52. A good landmark to gain your bearings along the way is a large boulder beside the river at 1.7 miles. Remember, this is not a loop hike. Unless you park vehicles at both ends, you will need to hike back, making for an 8-mile walk in the woods. For information about the Little River Community Trail, as well as a trail map, visit www.belfastbaywatershed.org. How to get there: From the traffic light in Belfast at the intersection of Route 1 and Route 52, drive south on Route 1 about 2.4 miles and turn right onto the driveway of the Belfast Water District office. Keep to the right when the drive splits and park at the back of the parking area, where there is a sign that reads “Hikers, please park here.” The trail starts at the nearby kiosk. Always follow the blue blazes (paint marks) on the trees, and you will remain on the main trail. A few side trails lead to views of the river and reservoirs. With an elevation of 1,049 feet above sea level, Black Mountain rises between two scenic bodies of water — Donnell Pond and Tunk Lake — in eastern Maine. The mountain is located within the state-owned Donnell Pond Public Reserved Land unit, and is home to a number of public hiking trails. From its bald east peak, hikers can enjoy a 360-degree view of the region. Dogs are permitted on the trails and on the beach, though they must be kept on leash at all times. The Black Mountain Cliffs loop — from the parking lot to the mountain’s west peak, down to Schoodic Beach, and back to the parking lot — is about 3 miles long. But to get the best views, you will need to hike off that loop about 1 mile to the mountain’s east peak, then backtrack to get back to the loop. In total, that will make for a 5-mile hike. The trail includes plenty of rocky spots and exposed tree roots, requiring hikers to watch their step, but the trail does not require hand-over-foot technical hiking. There are no ladders or metal rungs, making this hike suitable for dogs that have some experience hiking and are in good physical condition. Black Mountain Cliffs Trail starts at an intersection with Schoodic Beach Trail, less than 0.1 mile from the Schoodic Beach Parking Lot. At first, the trail climbs steeply through a hardwood forest, then levels out and crosses two old woods roads. The trail then starts to climb again, becoming increasingly rocky and switchbacking up a few modest cliffs before leveling off again and striking through a couple tranquil, grass- and fern-filled clearings. Near the mountain’s west peak, the trail comes to a trail intersection where you can turn left to continue the 3-mile loop and descend the mountain to Schoodic Beach Trail near Schoodic Beach. Or you can veer right onto Black Mountain Summit Trail and follow the signs for about 1 mile to the mountain’s east peak, which is bald and provides amazing views of the region. Back at the Black Mountain Cliffs loop, when you descend the mountain, follow signs pointing to Schoodic Beach. Eventually, you will cross a few bridges and the trail will end at Schoodic Beach Trail. There, turn right to walk to Schoodic Beach, which is a long, sandy beach located on Donnell Pond. Set back into the woods near the beach are several tent sites and outhouses. From there, simply follow the easy, 0.5-mile Schoodic Beach Trail back to the parking area. For information and a trail map, call 941-4412 or visit maine.gov/donnellpond. How to get there: From Route 1 in Sullivan, turn onto Route 183 (across from the Town Landing Road) and drive 4.3 miles and turn left onto the gravel Schoodic Beach Road. Drive 0.3 mile and veer left at the fork to stay on Schoodic Beach Road. Drive 1.9 mile to the Schoodic Beach Parking Lot at the end of the road. Start your hike at the far end of the parking area, on the wide, smooth trail that leads to Schoodic Beach. A short distance down the trail, cross a bridge and turn left onto the Black Mountain Cliffs Trail. For more of Aislinn Sarnacki’s adventures (and pictures of Oreo), visit her blog at actoutwithaislinn.bangordailynews.com. Follow her on Twitter: @1minhikegirl. Her new guidebook, “Family-Friendly Hikes in Maine,” is available at local bookstores, Down East Books and online booksellers.